After a rigorous competitive tender exercise, Reade Signs were selected as the national partner for the roll out of Linden Homes’ next generation of marketing suites across the whole of England. 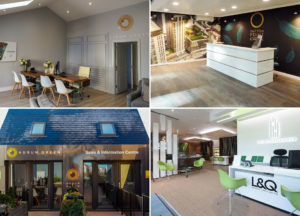 Having vast experience in installing marketing suites for a number of prestigious housing developers meant we really understood the objectives for the new design and were able to offer many suggestions to achieve the desired results at optimal costs. And no mean feat to ensure all aspects of health and safety were considered without detriment to the sales environment. 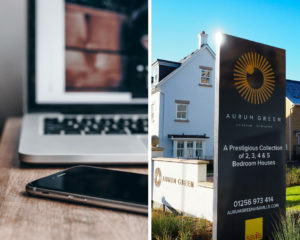 Our branding experience was also extremely useful in interpreting the clients’ brief for making the Linden Homes marque really stand out; an absolutely key consideration in today’s competitive marketplace. The client wanted the new format to be implemented as soon as possible and our challenge with this project was to get the first sites launched within 6 weeks of hearing we were the preferred supplier. 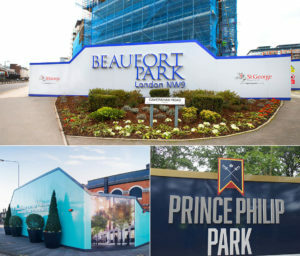 The design scheme was still being finalised during this period as a result of some of the suggestions Reade Signs’ creative team made during the tender process. As well as selecting the best materials and finalising the design of bespoke furniture to both improve appearance and usability, and provide an inspiring environment for customers to select the finish of their new home. Bartons Rise, a development located in Havant, Hampshire, had an urgent need to start pre-sales from a temporary sales cabin to respond to local interest and generate further prospects before the site was ready for a full sales launch. So it was to be the first installation under the new contract but the floorplan did not fit with the newly developed brand guidelines and hence it was key that Reade Signs were able to interpret these and deliver an alternative configuration to create an inviting customer environment. Reade Signs put in place the operational plan for delivery alongside the finalisation of the design guidelines so the two elements were able to work in tandem, so not delaying the launch of any marketing suites, critical to the sales success of each Linden Homes development. 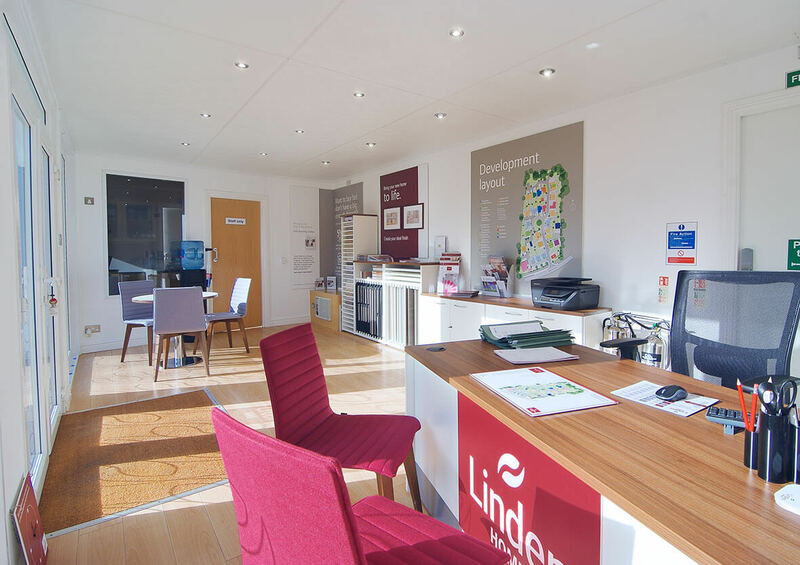 Working closely with the Linden Homes’ Marketing Team, we were able to ensure the tight timescales to the first launch did not compromise their design vision in any way.Addressing the space restrictions was the first task and prioritising both the layout and the graphics that could be used. The team at Reade were able to quickly design a footprint that could be repeated in similar sized units providing the key areas for Sales Advisor working, customer greeting and a useful meeting area. 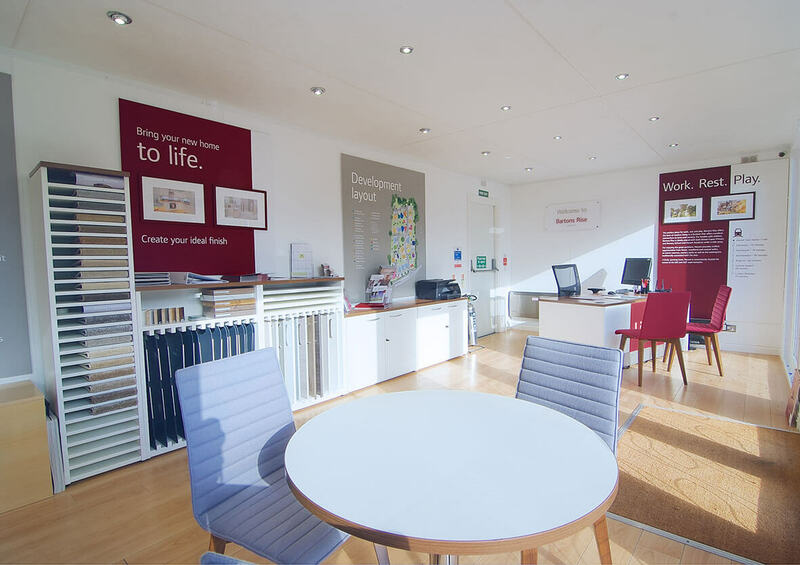 The cleverly designed bespoke unit to house interior samples for customer selection was also able to be included meaning visitors could get excited about selecting their personal home interior from day one. Added to this, plenty of storage makes the interior both practical and stylish. Cabin walls present another challenge when installing graphics. 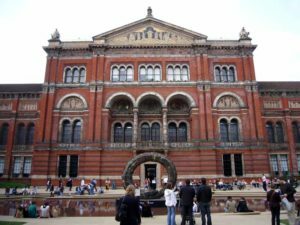 To enable a big and bold approach, Reade Signs recommended an alternative material to the agreed specification for permanent installations. Clever interpretation of the guidelines meant all of the key messaging could be included despite very limited wall space. And to make life as easy as possible for the local marketing team, all aspects of Health and Safety were considered by Reade Signs meaning the layout, escape routes and all statutory signage were included as part of the package. And lastly, the co-ordination of fitting with both sales and site teams meant a smooth and easy installation with handover on time to enable a positive and well-received launch. Years of successfully working on site mean we understand the needs of Site Managers with an excellent compliance record, as well as the client needs for a successful project. The result? A fantastic example of how a development can be showcased at an early stage to the local community. The space issues do not compromise the Linden Homes brand and the overall scheme is both welcoming and professional. “We invested a lot of time thinking about our next generation of marketing suites for Linden Homes, so finding the right delivery partner was a crucial step for us. Reade Signs’ experience not just in the property developer market, but in branding and retail knowledge made them our obvious choice”.